Find us Lost — Spruce Rd. 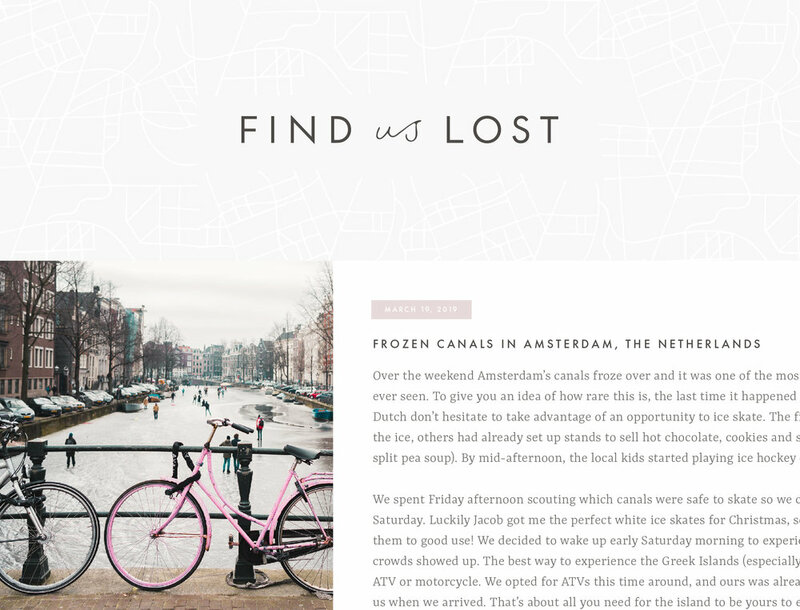 Find Us Lost is a travel + lifestyle blog that showcases inspirational and captivating adventures through beautiful imagery and comprehensive planning advice. To be the best resource for approachable (and dreamy!) travel planning by providing documented, high quality resources and travel guides for everything from choosing a destination + booking to finding the best local or off-the-beaten path destinations. Women age 25-39. Those with a spirit of adventure who dream of traveling but aren’t sure where to start. Typically in a relationship, has an enjoyable job but limited vacation. In need of an easy-to-use resource to expand her already keen knowledge and one that provides the ideal experience she’s looking for, yet at the same time won’t deter her significant other. Find Us Lost needs a brand identity that clearly speaks to its target audience as a unique, high quality and comprehensive travel resource. The Find Us Lost primary logo offers reader’s a glimpse into what the blog has to offer; a one-stop shop for discovering, planning and booking unique + dreamy destinations. The light-weight sans serif creates an airy, soft feeling yet remains professional and offers a sense of expertise. The script “us” hints at the unique destinations behind the brand. The secondary marks allow for diversity within the brand to be used throughout various brand components — whether with fun illustrative marks or represented as a tagline. Overall, the primary logo and secondary marks convey a unique and inviting presence with a hint at the high quality resources Find Us Lost reader’s will come to know and love. The color palette is an updated version of the soft pastel colors readers already know. These colors pair perfectly with the Find Us Lost photography. A charcoal gray is also used sparingly and not in a high-contrast manner. Photography, graphic elements and patterns are a unique opportunity to channel a brand's essence into something that will take the identity to the next level. Through this application, you can envision how the color, type, photography and logo all come together as a cohesive brand. These images are only mockups to help you imagine the brand in context. The patterns allow for exciting textures to create a cohesive look throughout the brand; especially within digital elements such as the website or email newsletters. The patterns can be used as an extra detail to make the Find Us Lost community smile and show the brand’s attention to detail. Overall, the brand identity creates a unique and inviting vibe with a hint at the high quality resources and inspiration that Find Us Lost will become known for.